At 66, Mick VanEffen can’t quite move like he used to, but he’s not one to complain. After a pair of traumatic injuries in 2011 threw him for a loop, he faced an uphill battle to regain his quality of life. Thanks to his positive attitude, and constant support from OSF Rehabilitation, Mick is able to do the things he likes to do, like enjoy retirement. The first medical hurdle Mick, a retired millwright who lives in Gladstone, ran into was a steel one – a 500-pound chunk of steel, to be more precise, and actually it ran into him in a workplace accident. Among his injuries was a cracked sternum, a broken collarbone, two broken ribs and a punctured lung, and in August 2011, Mick had to have surgery to have a shoulder replaced. A few weeks after surgery, while driving to physical therapy in Gladstone, which he’d started about a week earlier, Mick was driving about 50 miles per hour when his vehicle was hit head-on by another vehicle. Among the injuries he suffered, Mick’s femur was broken in two places, which required the surgical insertion of a rod and some screws into his leg. The accidents took a painful toll. The accidents started Mick down a road that would require a few follow-up orthopedic surgeries over the years. The most recent surgery was an ankle fusion in May 2017 that required about six weeks of rehabilitation. After every surgery, Mick has gone back to OSF Rehabilitation for care. Damon Hastings, a physical therapist for OSF Rehabilitation, gives a lot of the credit for Mick’s regained functionality to Mick himself. His injuries were so severe from his accidents that he required multiple follow-up surgeries, which meant new rounds of rehab. Throughout all of it, Mick never quit. Mick still deals with physical limitations, and he likely always will. But he’s not the type of person to dwell on bumps in the road. He still hunts deer. He’s a fair-weather fisherman. He spends time with his grandchildren. 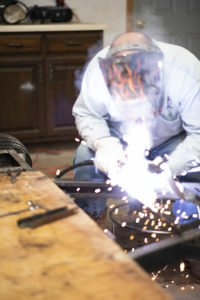 He welds in his workshop. He likes to do simple maintenance on his vehicles. Plus, he’ll still take a crack at repairing just about anything that needs fixing around the house. “I know I can’t do what I used to do, but I’m satisfied with where I’m at and what I can do. I go as long as I can and sit down for a bit. Then, go some more.